California Milk Advisory Board (CMAB) now has eighteen different television commercials featuring Happy Cows. The Real California Cheese Happy Cows campaign, launched in 2000, has won several awards and boosted California Cheese visibility throughout the United States. 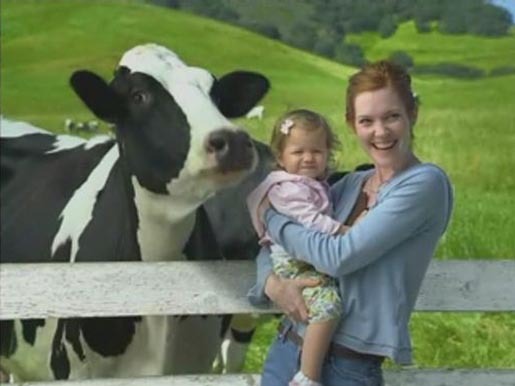 Every Happy Cow ad finishes with the voiceover, “Great cheese comes from happy cows. Happy Cows come from California. Real California Cheese.” The most recent two Happy Cow commercials were released at the end of 2005: Fence and Photograph. Two bulls compare notes. “You’re from back East, right?” “Hhm? Yeah! Trust me on this one. The babes out here are different”. “How come?” “I dunno. All the sunshine I guess. Clean air. Good food. Something. They really take care of them.” “Woah! Oh yeah!” “Those are real!” The ad was followed up with “Here She Comes”, in which the same two bulls pluck up courage to talk to the cow of their dreams, and “Girl Talk”, in which they eavesdrop on a conversation in the barn. Click on the image below to play the Bulls Those Are Real video in YouTube. In “Ding Dong” two bored cows debate about breaking for a nap or a snack. 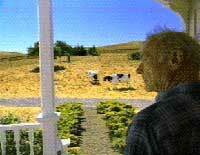 The scene cuts to a farmer answering his doorbell. There’s no one there. All he can see is two guilty-looking cows giggling in the distant field. In “Cloud” cows graze in a field under sunny skies. Their bliss is briefly disturbed by the rainy season, a season defined the presence of a solitary cloud. In “Winter Breakout” cows stand at a fence, surrounded by nothing but snow. They’re watching a member of their herd attempt to break out, heading off to California. In “Race” two cows compete in a grassy open field race. After taking off for a dash with much fanfare and cheering from two spectator bulls, the cows become easily distracted by patches of dandelions and never quite make it to the finish line. In “Talking Pig” a pig attempts to join the herd. The Happy Cows campaign was developed at advertising agency Deutsch, Los Angeles by a large team, including chief creative officer Eric Hirshberg, associate creative director Karen Costello, associate creative director Chris Rebeico, associate creative director/art director Michael Kadin, associate creative director/copywriter Eric Springer, senior art director Dave Sakamoto, art director Yooly Mukai, junior art director Rachel Everett, senior copywriter Craig Ghiglione, junior copywriter Hilary Haselton, director of broadcast production Randy Morton, executive producer Steffi Binder, and agency producer Rebecca Darvin. Filming was shot in Petaluma, California by director Chris Hooper, at BOB Industries, Santa Monica, with director of photography Stephan Treschow, executive producer John O’Grady, and producer Karen Rohrbacher. Editing was done at Chrome Editorial, Santa Monica by Adam Parker and Dean Miyahira. Colorist was Mike Pethel at Company 3, Santa Monica. Online Editors were MB Emigh and Christine Goldby at The Syndicate, Santa Monica. Animation was done by Michael Killen at Animal (also responsible for Taco Bell talking Chihuahua), with graphic artists Kevin Prendiville and Christine Goldy, and producer Kim Evans. Composer was PJ Hanke at Spank Music, Santa Monica, with executive producer Katie Jones. Audio Engineer was Loren Silber at Lime.